Cornish Pirates head coach Ian Davies says he is impressed with the way his side's defence has performed so far this season in the Championship. The Pirates have conceded 128 points, a record bettered only by runaway leaders Newcastle Falcons. 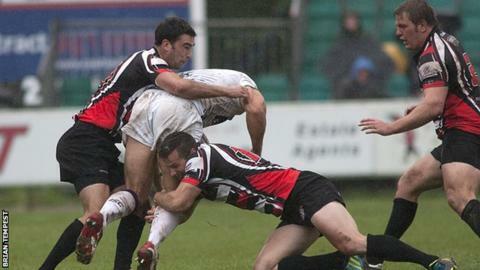 "The defence has been good all year, we're second in the defence table," Davies told BBC Radio Cornwall. "It's just the attacking side of it, we need to be a bit more clinical, but that will come." The Pirates have scored 122 points, the second worst tally this season after second-from-bottom Doncaster, with Canada international back Matt Evans scoring seven of the club's 13 tries so far. But Davies says they are beginning to get used the system he wants to employ and he expects their scoring levels to improve. "The boys are certainly enjoying the way we're playing," he added. "They're also starting to understand how we're trying to play and hopefully that will bear fruit over the next few weeks."